I’m awake at 3:30 – my initial reaction is “what fresh hell is this”, but I’m actually feeling better than I have any right to be, considering I didn’t eat last night. 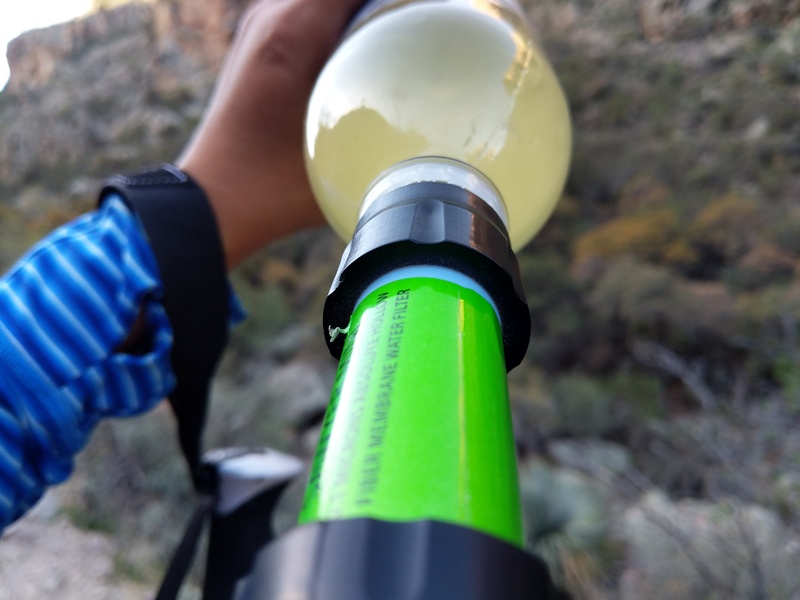 Not that I intend to eat now; I’m writing for the blog, taking notes from yesterday for the water report, generally reviewing the day to see what’s in store for us. I should do this more often. 4:30 comes soon enough, and it’s been seeming that I need about an hour to get out of a morning, so I’m on perfect pace to pack up and get out by 5:30, the agreed-upon hour. We’re walking by 5:32. 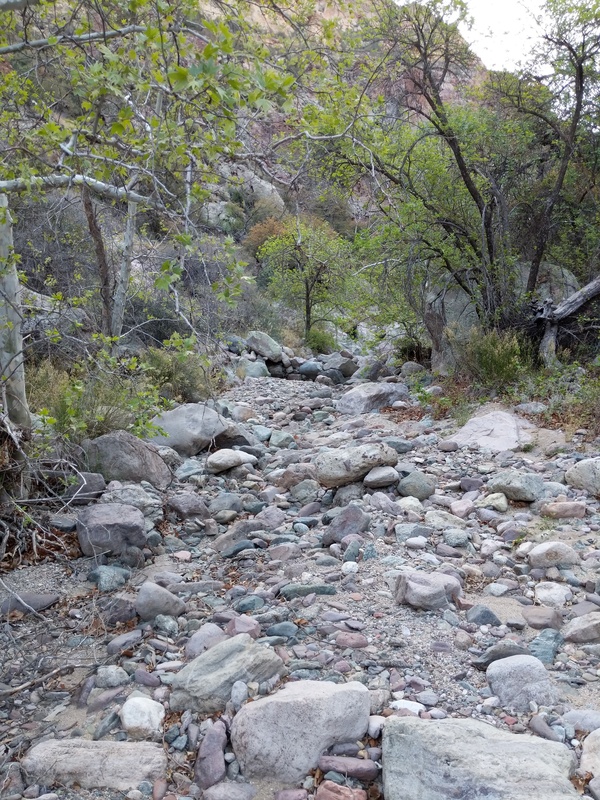 We turn off the JF Trail onto the Rogers Canyon Trail immediately this morning, and the change in movement speed – with the coming light and the better tread – is remarkable, so I do remark on it. 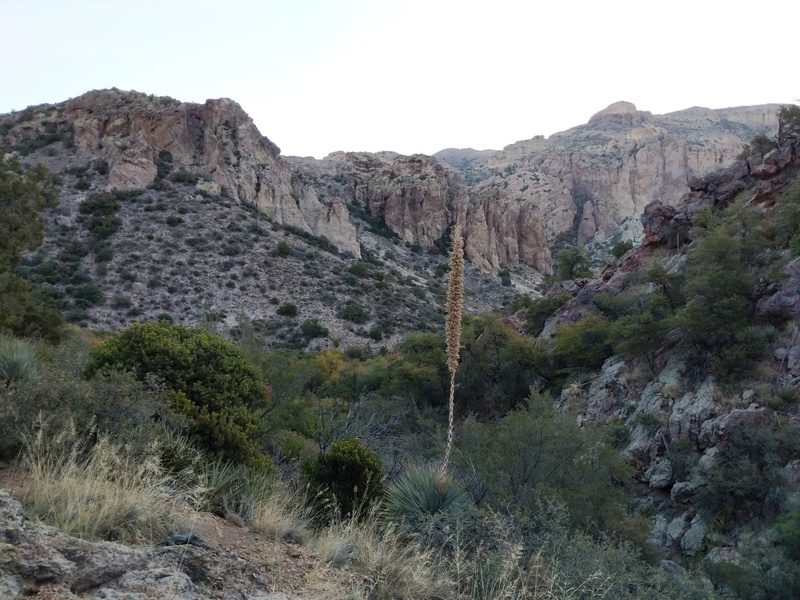 It’s a sharp up, a quarter of a mile to Tortilla Pass, but the morning is cool and beautiful, so it’s hard to mind. Down, down we go, towards Rogers Canyon, the beauty of the morning multiplied by the fact that the walls of whatever interim canyon we’re in are still blocking the rays of the sun. so nice when it’s like this. wish it lasted longer. 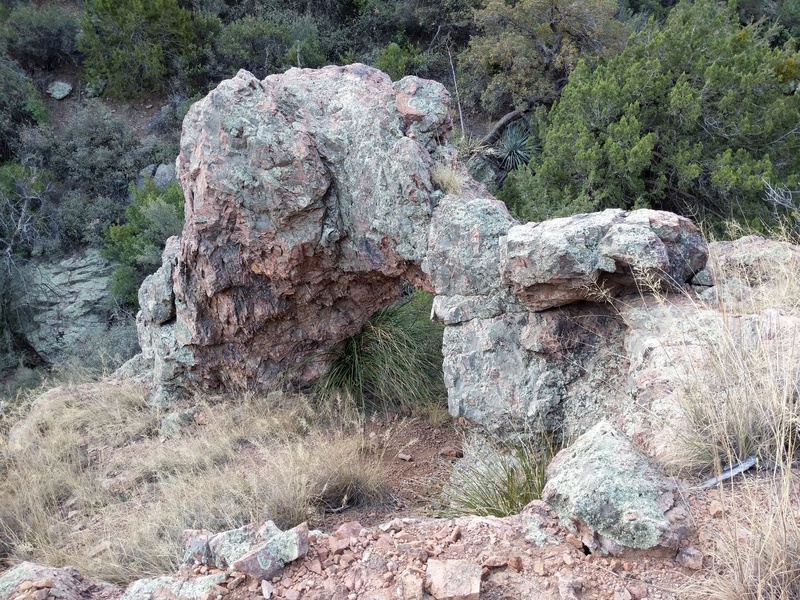 random arch?? funny how nature be like it is. After a solid mile of fighting our way down the trail, we cross a wash, and suddenly, open camping field where apparently many people have slept! We think the trail might be less overgrown from here, and it is. 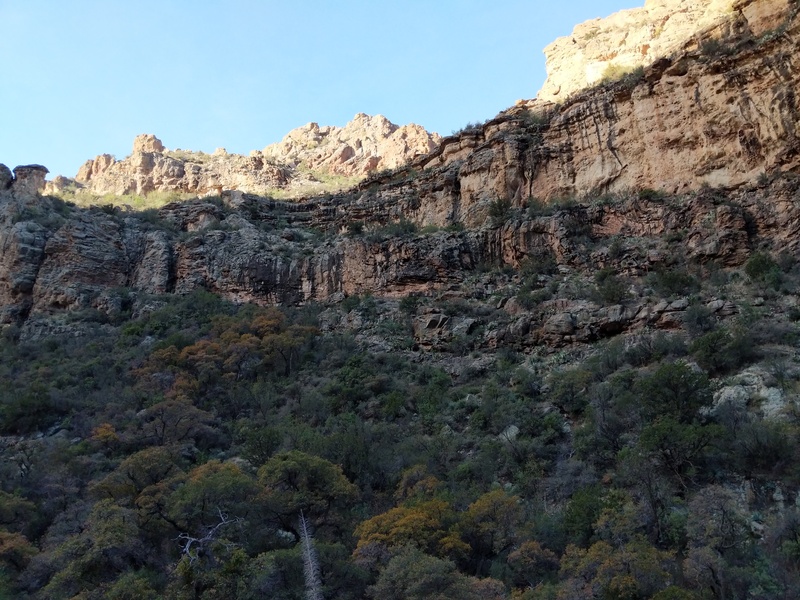 And with high canyon walls to our east, we’ll be protected from the sun longer than usual today. Cheers all around! 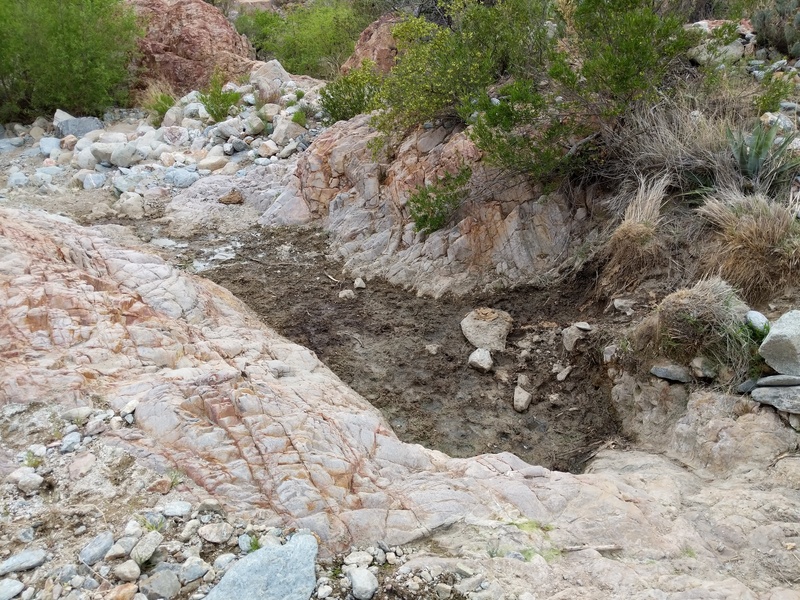 The trail is in and out of the wash, which, while harder, makes things kind of fun. A good kind of focus, after the painful foci of earlier. And then, the reason I imagine the GET made it a point to come through here at all: cliff dwellings, visible over the wash to our left. you can kind of see bricks in the larger opening in the back wall on the left. they’re there, promise. We walk and talk about life, about humans, about the people, the natives, who lived here in this place all that time ago. It’s hard to fathom having a history, a connection to place like that, and I wish we did more to foster those connections rather than ahistoricize and destroy them. …proper tree shade, in what is, in wetter times, a verdant canyon. Even in the shade, though, it’s important to hydrate. 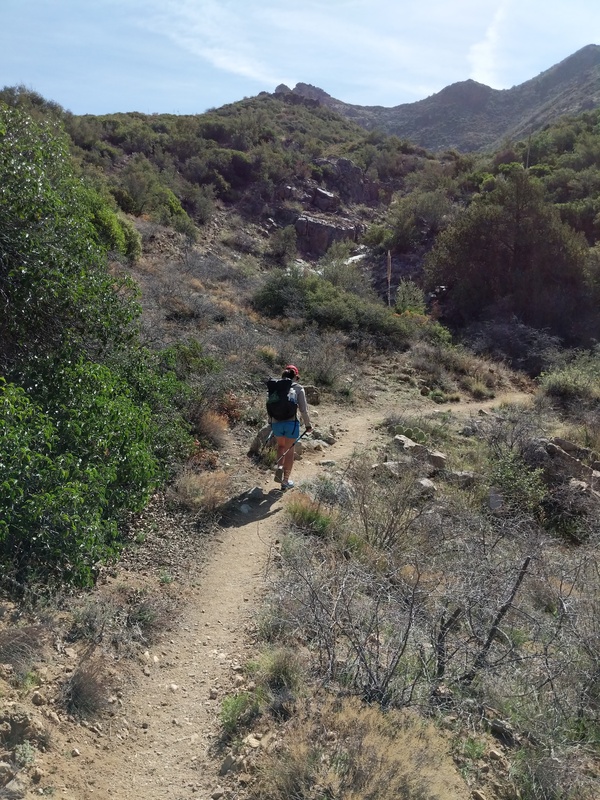 Traveling through sun-dappled shade, we eventually find what we’ve been waiting for: the Arizona Trail. Suddenly, magically, trail maintenance! 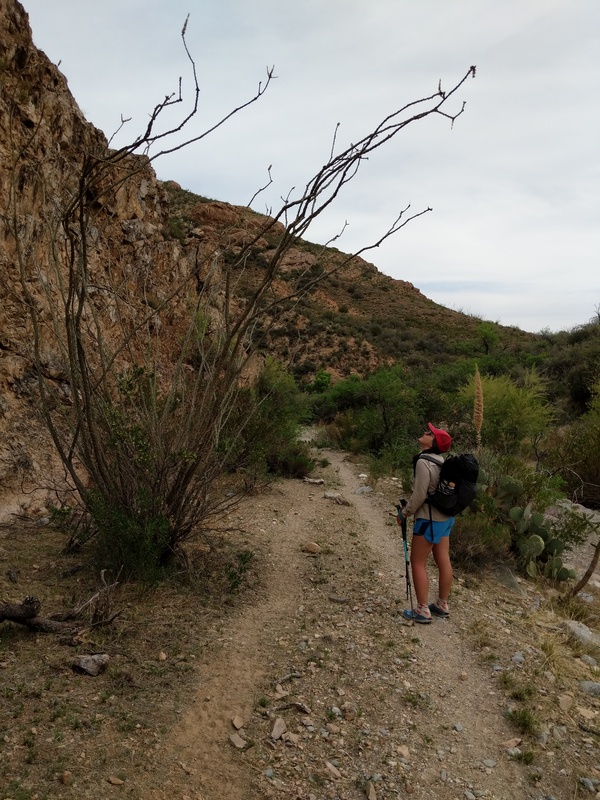 It’s uphill but it almost doesn’t matter; being able to stretch my legs and WALK rather than tiptoe through around over brush cactus rocks is an amazing feeling, and this is the first day of the hike where I’ve truly felt it. 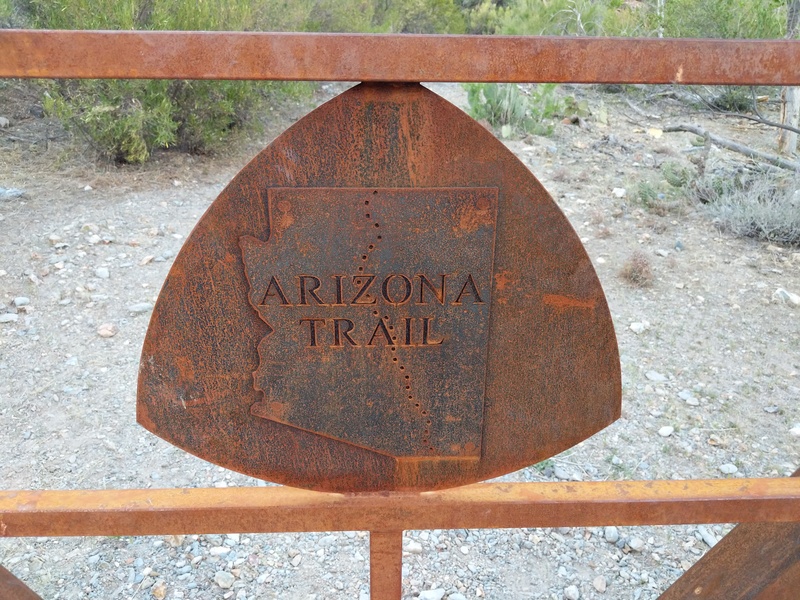 It’s easy to go all the way to Rogers Trough Trailhead and the end of Segment 1 – 30.2 miles from where we began three days ago. The distance, the days, feel like a lifetime. We deposit ourselves unceremoniously to the far side of the large parking lot, celebrating by resting our creaking bones in the shade. 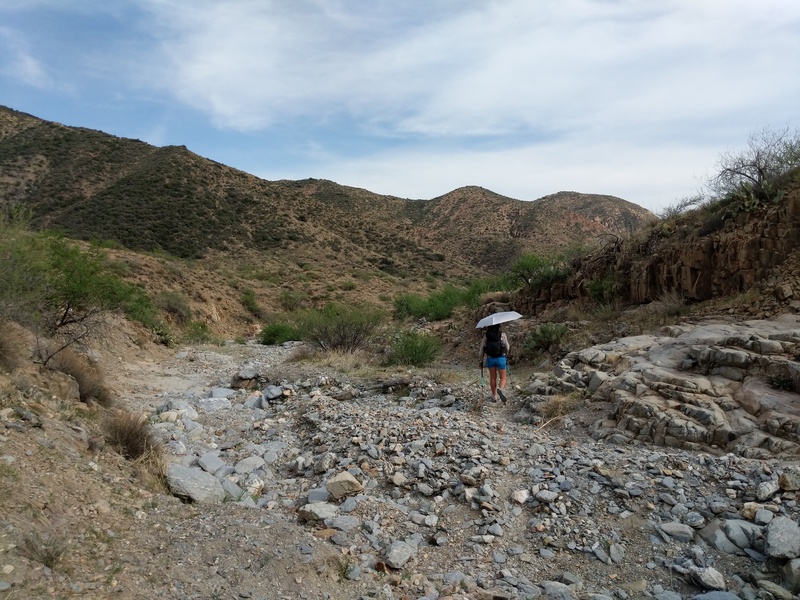 While the water report says one can yogi water off of ATVers at this junction – and it seems a much better prospect than drinking the mosquito-larvae-riddled extra water we fished out of a pothole in a rock about a quarter mile back – it’s a weekday, and I’m skeptical as hell. 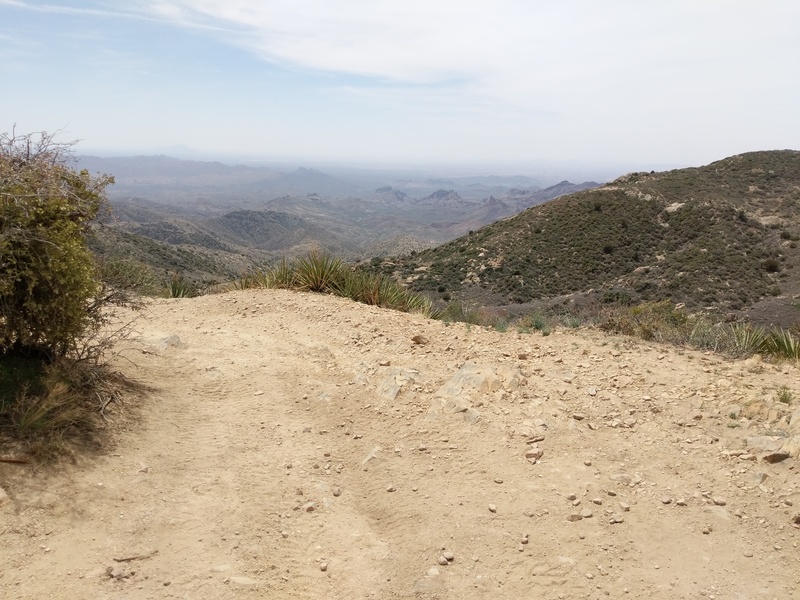 It’s not ten minutes before we hear the rumble of not one, not two, but three engines, all folks up to explore the back roads here in the Tonto National Forest. We don’t reeeally need the water, but they give us a Gatorade in exchange for answering their questions about what we’re doing and why. They ask us if they can do anything for us; we decline, but thank them again for the Gatorade. It’s not until they’ve pulled off that I remember that I’m carrying extra trash. Welp. Guess I’m still carrying it. 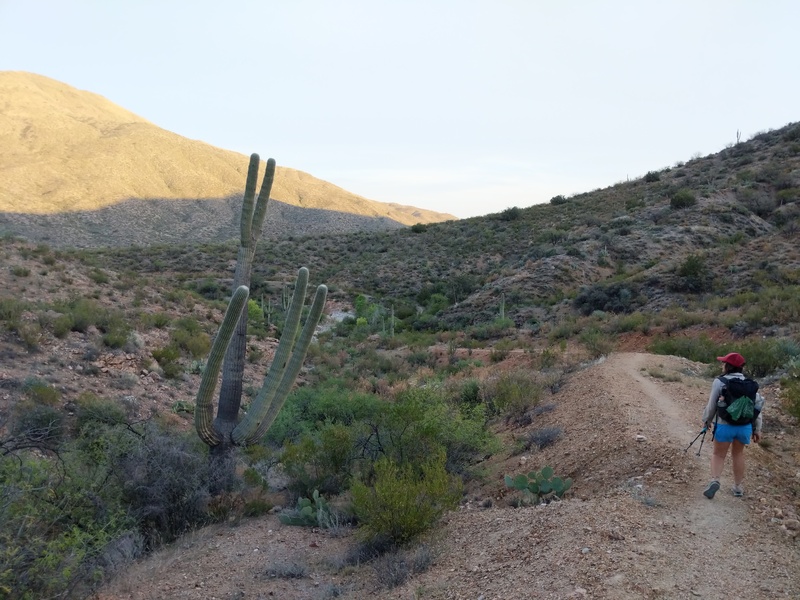 We get to bypass a road section on the Arizona Trail, but it’s straight up – I, as I am wont to do, blame the mountain bikers, before wondering whether we’re still in the Superstition Wilderness. No sense in blaming folk for what they’re not responsible for. The Forest Service road we rejoin is more chill than I think it will be, and leads to a bit of a roadridgewalk! Ridges, though, mean our sunbrellas are fighting the wind, and the lean is a little much, so instead we let the sun shine down on us. 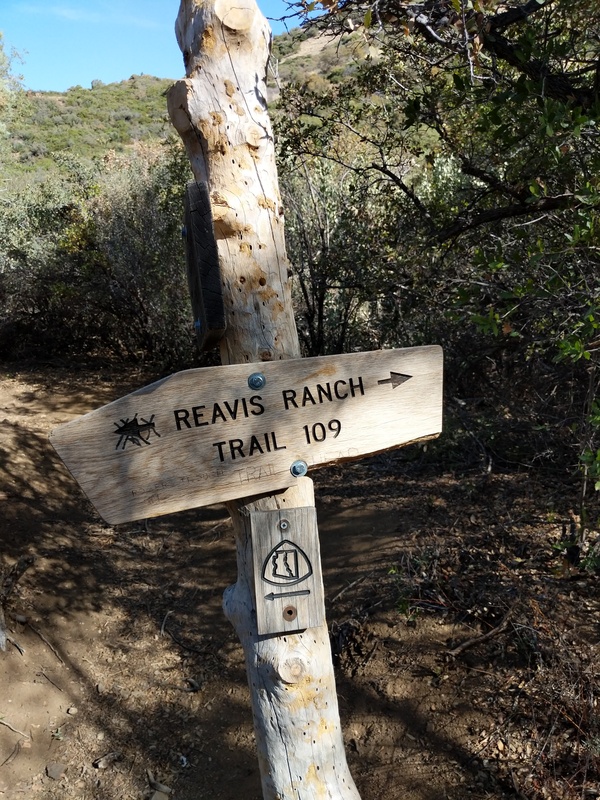 A wee hiccup of a down back on trail, and we’re at the top of the Reavis Canyon drop – so many switchbacks, all down the canyon. We stay at the top for a break under a juniper, fight the flying bees flies gnats all trying to harass us while we cook, eat. Then, it’s a lot of downhill from here. 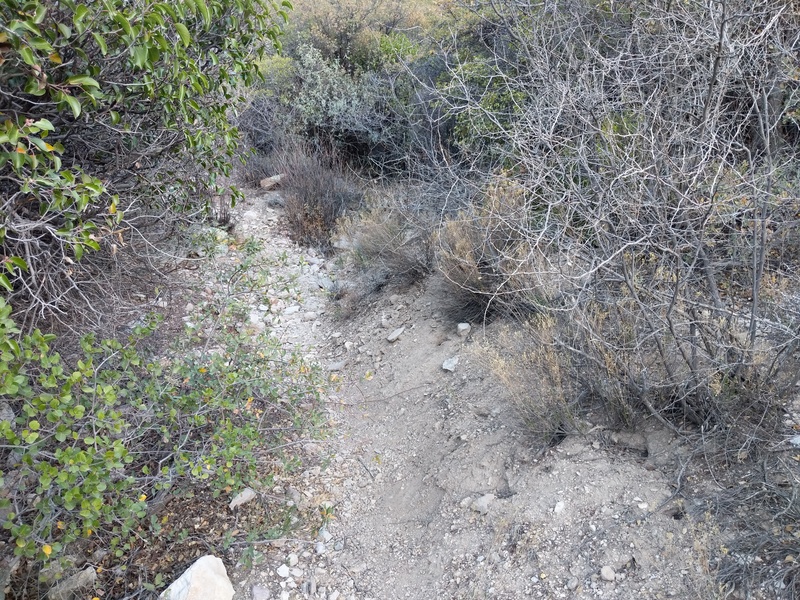 There are “many switchbacks” here, according to the map, but “many” doesn’t even begin to cover it, and “switchbacks” seems to be a stretch too – why even switchback if the trail is going to go straight downhill during those switchbacks anyway? It’s hard, carrying so much water, hard on ankles shins knees hips legs all of it. But I need the water, so I keep the water. 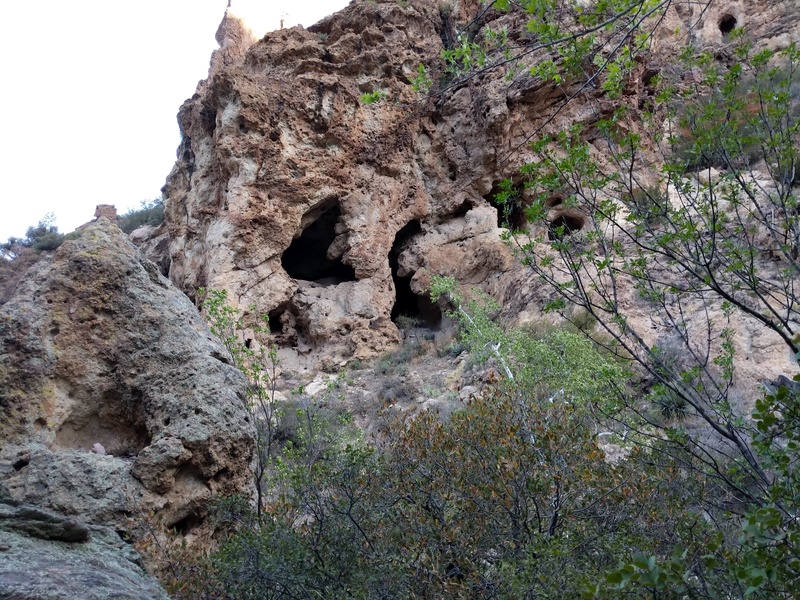 Down, down past a cairn guardian, down to the bottom of the canyon. 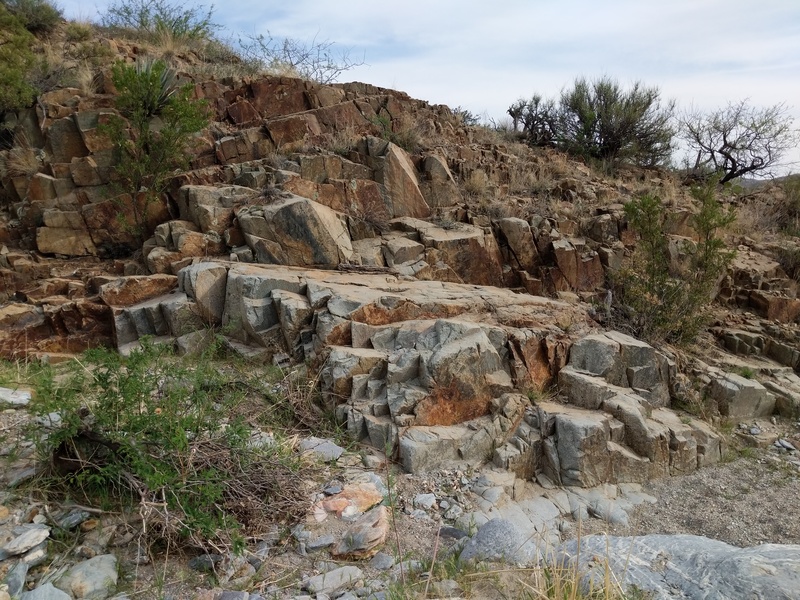 At the bottom, fun rock formations line the wash, which the trail dips into and out of intermittently. how much angles? all over the place! goddamn! so many angles! Soon, there are flowering plants and pollen EVERYWHERE – so much so, that I’m beginning to get a sore throat from all the everything. I’d be more mad about it, but it’s so beautiful compared to the last two hiking days. cow poop infested much? yeesh. 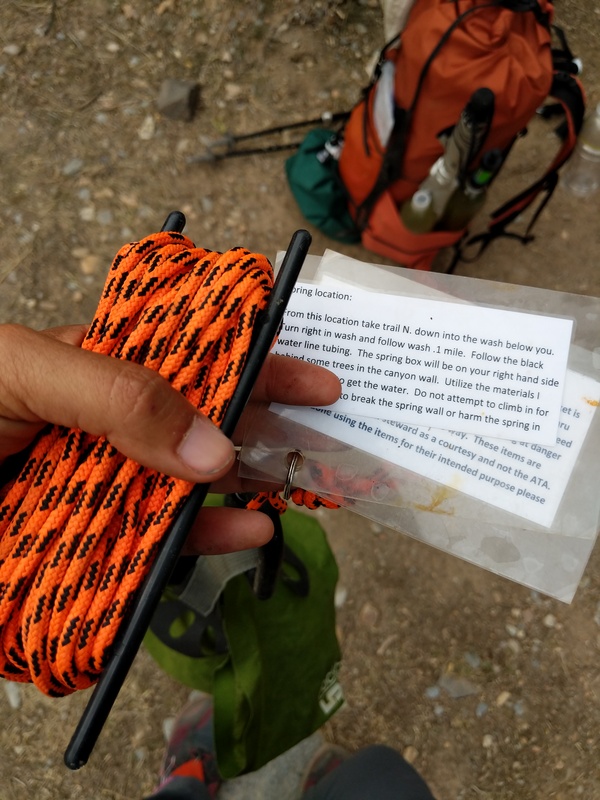 We’re happy, if momentarily terrified, when we arrive – the trough is empty, but there’s a green ammo box nearby with a bucket, rope, and instructions for finding the hand-built well around the spring proper. So it’s a scavenger hunt in the wash, and the prize at the end is cool, beautiful water that we fished up out of the well and that came right up out of the earth. So lovely. We take the bucket back and dry it, as per instructions, before leaving it just like we found it for the next folks to find. Oasis. We’re overwhelmed by beauty today, graced by the concurrence of our route and this lovely trail. It won’t last – it never lasts – but it never hurts to appreciate in the now. We hope the gates are leading us away from the cows, but there’s still cow poop everywhere soooo maybe not. I’m convinced that the term “old corral” – the campsite we’re aiming for – means “no longer in use” which means “no cow poop”, but as a part of an open range I’m definitely dreaming. Still, it protects us from the wind if not the gnats, and treats us to a beautiful sunset. 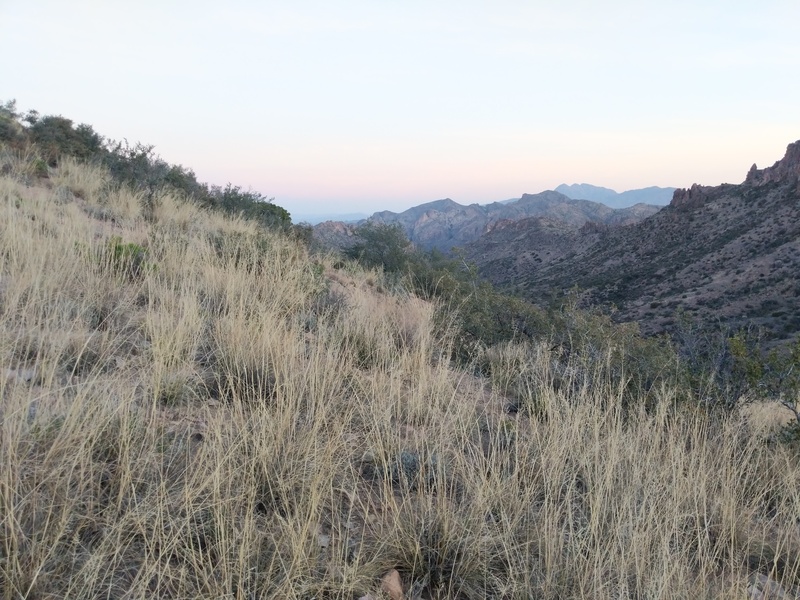 Unworried about bears this low in elevation, I cook in my tent, and a couple of AZT hikers come by. Crash and Squarepants are back on trail and ready to hike up all those switchbacks in the night. 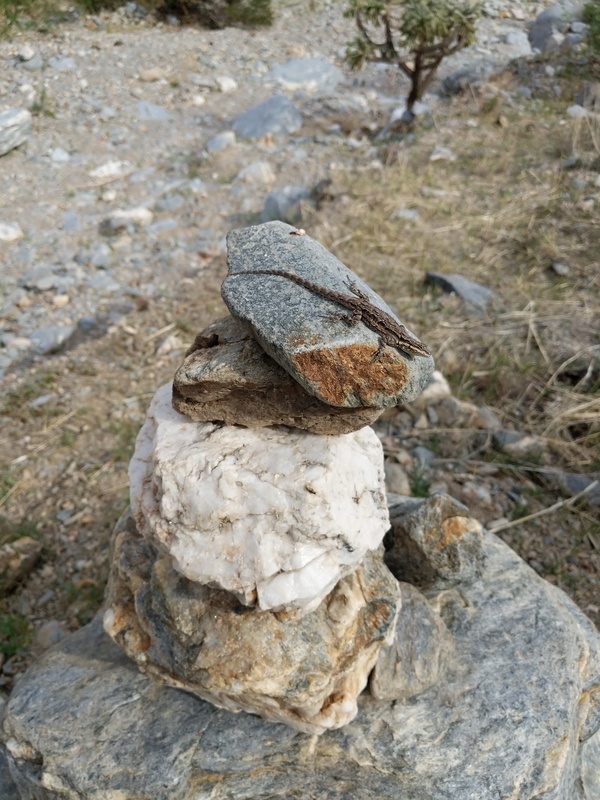 I shudder at the prospect, wondering, briefly, if I’ll ever be a real hiker – before realizing that I couldn’t have gotten this far on this route if I wasn’t. I’m just a different hiker. A hiker who doesn’t like to night hike. Which is inconvenient, particularly with the heat we’re in, but which is a-okay. We hear the lowing of cattle nearby as they depart – we’re unsure if they’ll find us in the night, but cows are diurnal, right? They’ll be asleep. No way I’ll wake up to a cow lurking over my tent menacingly. I try to chase the thought from my head as Orion swings westward in the sky, and I, like him, trundle off to sleep.